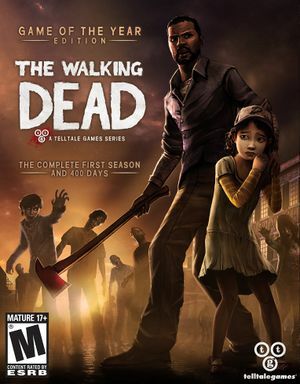 For the unrelated Activision game, see The Walking Dead: Survival Instinct. 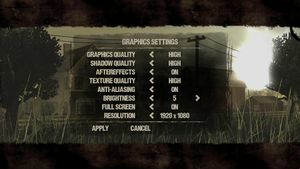 8.5 Steam version: Game Choices not saving between episodes or Episode showing "Coming Soon"
By default the Nvidia profile does not have SLI compatibility bits for the game. If you have a SLI setup on your computer and would like to improve your general performance you might want to enable SLI support. Open the game profile via NVIDIA Profile Inspector. Use Flawless Widescreen or Widescreen Fixer. There is no indicator of which antialiasing is being used. Enabled by default; use -novsync parameter to disable. No frame rate or refresh rate cap. XInput controllers only; for OS X use OsxDriver. Fan translation. Details missing—please edit this page and add it. See Helix Mod: The Walking Dead. Standard Steam troubleshooting is required. Verify the integrity of the game cache, and run Steam and the game as an administrator. If it's still not working, right-click the game's executable, click Properties, click the Compatibility tab, and then check the options to run in compatibility mode for Windows 98/ME. Also check the option to disable desktop composition. Another solution is to check if your steam.exe is being run with Vista compatibility mode, go to C:\Program Files (x86)\Steam\Steam.exe or Steam Application(or your variant path) right click the application, then click Properties, and find the Compatibility tab. Check if the application is being run with Vista compatibility, if so and it is grayed out click "Change settings for all users" and un-check "Run this program in compatibility mode for:" and click apply. 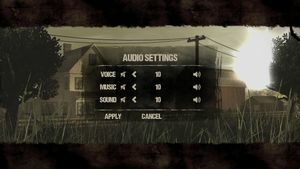 Once this is done close your steam.exe and all steam related processes or restart your computer, restart Steam and launch The Walking Dead this "should" fix the issue, and fix the stuttering caused by using the advent of the Windows 98/ME fix. On a sidenote before trying this fix make sure your "The Walking Dead.exe" isn't running in Windows 98/ME compatibility mode. If it is, it makes this fix pointless because the actual game is still being run in that compatibility mode and will still cause stuttering. If you start the game while the program "D3D Overrider" (v2.0.1) is running in the background, the game will possibly crash. The current solution is to close D3D Overrider while you play the game in this case. Turn the shadows off within the in-game settings. Caused by anti-aliasing being forced by the AMD Vision Engine Control Center. Set anti-aliasing to 'Application Controlled'. Install the latest DirectX End-User Runtimes. If problems persist, download dinput8.dll and extract into the installation folder. The game should now launch. Unplugging game controllers may fix the problem as well. Another possible solution (Windows 7): Make sure that Steam is not running in Vista Compatibility mode. First make sure Steam is not running. Right click Steam icon, select properties and the compatibility Tab. If "run this programme in compatibility mode" box is ticked untick it. The game has an error where no videos or gameplay will begin if the resolution is incorrect (leaving you either with a black screen, or your desktop view). This also crashes dwm.exe and will not allow you to shut off walkingdead101.exe. To get the game working, button mash Alt+↵ Enter to force the game to change into windowed mode as soon as it loads up. This should load the game and allow you to reset the resolutions in the game settings. Steam version: Game Choices not saving between episodes or Episode showing "Coming Soon"
The Steam version of the game stores two copies of a file called prefs.prop on your computer in different locations, and sometimes these can get out of sync. It is highly recommended that you back up all your saves and both prefs.prop files in a completely separate location before you do this. Copy this file into the other folder, overwriting the smaller one. If copying the largest file doesn't work, go to the backups and copy the one with the latest modified date over the older one. The file you replace may be in either the user folder or the Steam folder, make sure you compare them both. For OS X, the latest version of prefs.prop might be under any of the folders in the Pack folder under your Steam folder inside TheWalkingDead.app. Right click it and choose Show Package Contents to access it. The user folder save location on OS X is ~/Library/Application Support/TellTale Games/The Walking Dead. Less than a fix, this is a workaround. The crash occurs on the intro page after 'click to continue' when the game displays a progress bar saying 'connecting'. Disabling your network (e.g. via explorer -> 'my network places' -> 'connections' or via the Start button -> 'control panel' -> 'network connections'), will make the game run under these circumstances but you won't have Steam achievements as all of your network is down. Right-click on the appropriate icon (must be blue = active) and pick 'deactivate'. Remember this icon's name. After you have stopped playing you want to right-click and ACTIVATE your network connection again. Intel integrated graphics, Mac Minis or early-generation MacBooks not recommended. ↑ 1.0 1.1 File/folder structure within this directory reflects the path(s) listed for Windows and/or Steam game data (use Wine regedit to access Windows registry paths). Games with Steam Cloud support may store data in ~/.steam/steam/userdata/<user-id>/207610/ in addition to or instead of this directory. The app ID (207610) may differ in some cases. Treat backslashes as forward slashes. See the glossary page for details. This page was last edited on 1 April 2019, at 06:28.